Are you a talented therapist but wonder how to associate with doctors and other health care providers? Are you looking to establish yourself as the premier choice when other practitioners need or want a referral for their clients and patients? Do you struggle to get enough clients? 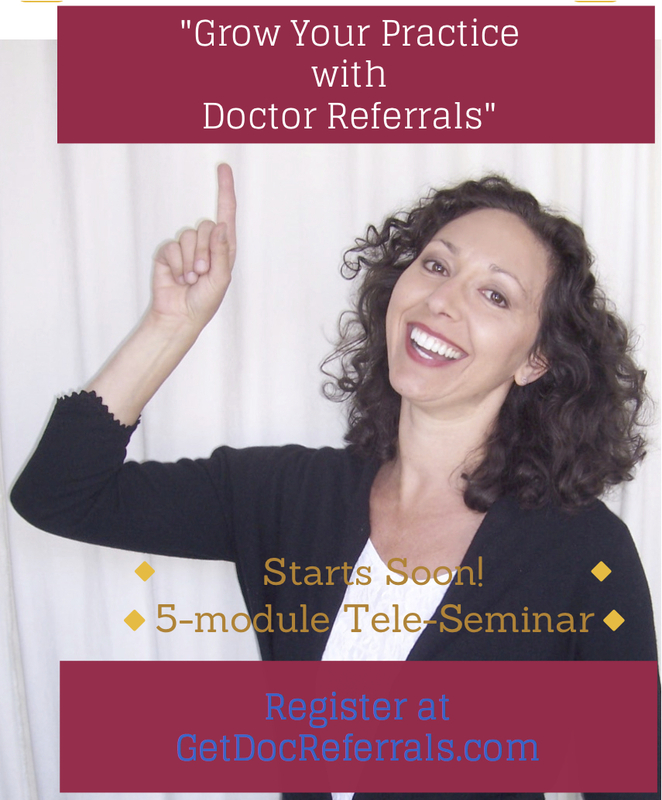 Do you want to know the “Secret” to getting clients to Book & Re-book with you for medically-necessary care? The ‘secret’ to a constant stream of clients is to have doctors and other health care providers refer their patients to you. My 5-module Home-Study Virtual program will teach you how! Want to create your very own “We Give Back” program? many clients as you want, each & every month! “Give To Get Gold, Community Outreach & Client Acquisition System”. 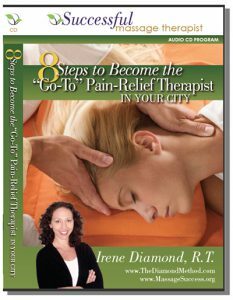 On this 3-CD Success Program, Irene explains the most critical steps you need to take to start and grow a Successful Massage Practice. Re-focusing and getting the right mind-set is what makes the difference between therapists who succeed and those who flounder and fail. If you don’t believe you can succeed, you’re facing an up-hill battle and will never see big success. Once you’ve switched how you perceive you can succeed, your clients will perceive YOU as more successful and they will see you as the expert that can help them resolve their pain or issues. This can happen even while you are still learning! Simple steps, strategies, and tactics for getting more clients and keep them coming back. You don’t need to be the ‘cheapest’ therapist in town to get more clients. 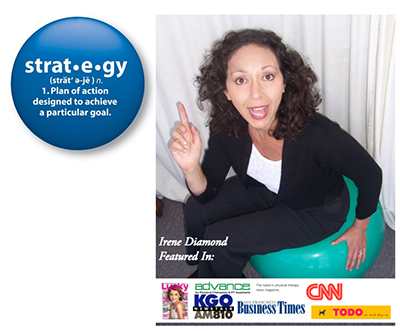 Learn from Irene how to get your practice booming so clients come to you and beg you for appointments! Marketing ideas you can use right away to help you promote your practice to the people who need and want your massage services. This 3 CD set is a physical package and will be shipped right to your door within 7 days! Insight, tips and strategies you can apply TODAY to start filling your appointment book! Are you struggling for more business? Do you wish you had more dream clients returning for more appointments with you? Do you get frustrated when clients leave and don’t re-book? Would you like the financial security of a full appointment book? On this MasterClass interview of Irene Diamond, host Siobhan Guthrie from Ireland asks Irene some very advanced-level questions. 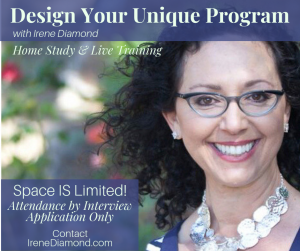 You will discover Irene’s tried-and-true secrets of how you can keep your appointment book filled (with dream clients0 to grow your practice. Now you can create a more thriving therapy business without feeling uncomfortable or intrusive — even if you really dislike selling or marketing! How to gracefully re-book your clients before they leave, so they want to come back and see you. You NEED to know how to let clients and other health care providers know what you do. You NEED to know how to set yourself apart from the rest of the therapists in your town. You NEED to know how to be recognized as the GO-TO therapist when someone is in need of your expertise! 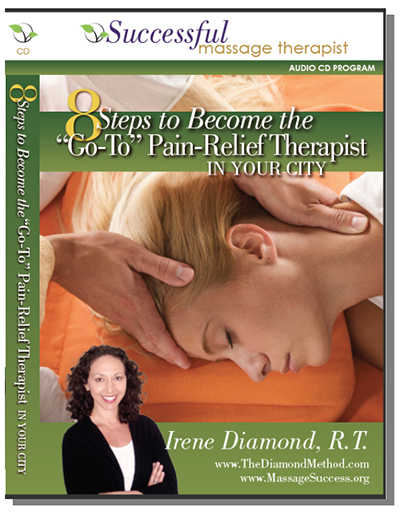 On the CD, you’ll listen to me, Rehab Therapist and the Creator of Active Myofascial Therapy, guide you to become the Go-To Rehab Therapist in YOUR City! How (& Why) To Charge More for Your Rehab & Pain Relief services than you do for your massage! You NEED to know how to get clients and patients solid, clinical results! You NEED to know how to set yourself apart from the rest of the therapists in your town! You NEED to know how to STOP only selling single sessions! How (& Why) To Set Your Fees & Charge for Your program. I open this program once a year ~ I would be happy to see if and how I might be able to have you attend the next program or go through the HomeStudy Program. Request a conversation to see if this program is now open for you to participate so you can begin serving your clients and patients with your SIGNATURE PROGRAM! Consider transitioning from what Irene Diamond calls an ‘Open To The Public Practice’ and switch over to a ‘Precise Private Practice’ business model. More ease & grace, less stress, working ONLY with the Precise Dream Clients you love to work with who you can get the best results with. “4 Phases of Care: Road Map to Wellness” do the explaining for you. When you first see a client they will present to you somewhere along this 4-phase continuum. Ask them your initial questions (These key questions are included with purchase) so you know which of the 4 Phases of Care they are in. Once you’ve identified what phase they are at, circle the phase name. Ask them to confirm which of the Feelings they have and circle them. Together, check off which of the Goals of Therapy you will help them with. Write the suggested frequency in the yellow box for your Therapy Plan recommendation. Clients will easily see the need to progress up the 4 phases which means they will easily book their additional sessions with you to reach their desired state of wellness. 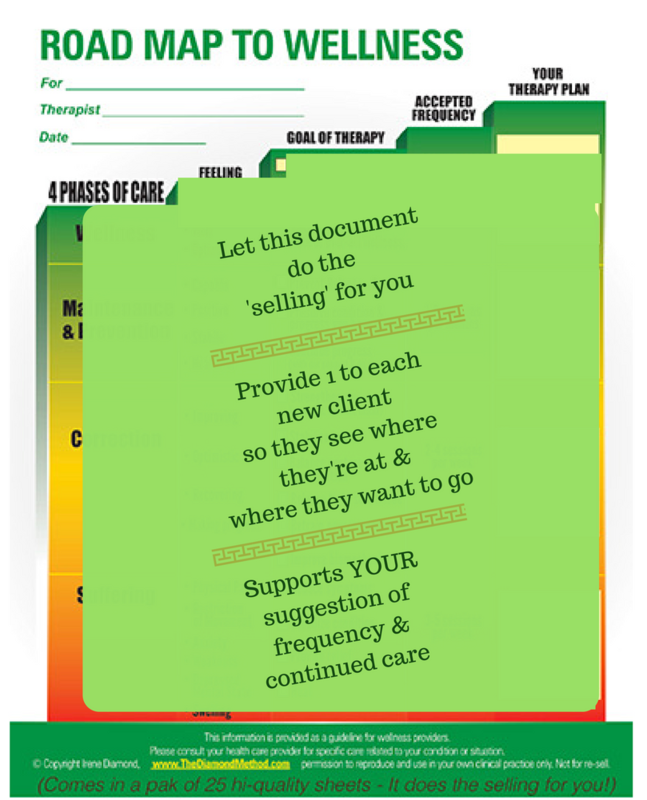 Each time your client’s needs change (based on their condition and progress you are making) you will take a new sheet and modify their therapy plan. Finally, with this tool, you will easily be able to speak with clients about their level of wellness and having this color visual document at your finger-tips does the ‘selling’ for you! Printed instructions and 2 short video trainings are included in your product. You will learn exactly how to use the document in your practice. I will share with you the Critical Key Questions to ask each client as you begin to define their therapy plan. NOTE: This is a physical package of 25 sheets to be used only for your clinical use. Customers shipping to countries outside the USA will be contacted to pay for nominal shipping fees. Does your practice need some hand-holding to get you un-stuck? Or do you simply want some answers or insight on how to simply get you rocking on the right path to success? Over the past years, I’ve been the “hidden secret” behind hundreds of successful ‘Thera-preneurs’ who are having fun helping clients they love, and earning big money — all because together, we’ve designed their dream practice. And I would love to do the same for you! You may apply for you “Business Diagnosis” Session with me to find out what you can do to grow your business, get more clients and have more success. I only reserve 5 – 10 sessions each month and one of the spots can be yours if you qualify. If you would like me to help you clarify your vision and your goals for your practice, so you know how to really thrive in practice, click here to apply for a no-cost “Business Diagnosis” Session with me, and if you qualify my team will schedule your Free session with me to guide you to know how to reach the next level in your business.